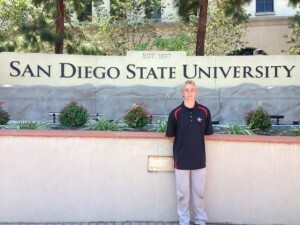 We want to congratulate Ryan Orr on verbally committing to play college baseball at San Diego State University. Here is Ryan’s recruiting story and interview from after he committed. We wish Ryan the best as an Aztec! Ryan has a verbal offer and has given a verbal commitment. He just started his Jr. year in high school. The recruiting process went relatively fast. He had done well in National Tournaments the summer between his freshman and Sophomore year so he started getting on some college’s radar. The key in my opinion is that he plays with an excellent travel ball team (San Diego Show) so he was at the big tournaments and there were lots of scouts watching the games. They may have been there to watch other kids but he had his chance to make an impression. His club team also does a good job of getting his and other kids names out to the colleges so they take a look. Before every big tournament Ryan would also send out e-mails to the colleges he was interested in providing a link to his Sportsforce website and letting them know when and where he was playing. Due to the # of hits on his webpage we think it played a big role in him getting seen. He was talking to a few schools going into this last summer between his Sophomore and Junior year. That is when things started moving quickly. He did well in the Perfect Game WWBA 16U National Championships in Georgia hitting .542 and making the all tournament team. The Perfect Game tournaments are key to getting seen. They are by far the best run and have the most scouts. Doing well in this tournament got him invited to the Perfect Game Underclass All American Games at USD. He did well there as well. The day after this Showcase we did the SDSU visit and Ryan was given the verbal offer. He also did a visit to another DI school in CA that same week and while the baseball program is excellent, Ryan was not thrilled with the location nor feel of the campus. He also did a drive by of another D1 school that was interested in him but did not like the campus location nor feel. SDSU was clearly where he wanted to go so he committed on 9/16. San Diego State: The baseball coaches did a fantastic job of presenting their program and our entire family felt like they were being very honest and upfront about what the program offered. Clearly they liked Ryan and made him feel very welcome. They gave a great campus tour and the facilities were impressive. The program is also on the upswing with 2 NCAA tournament berths in a row and the coaches made it clear that their next goal is to advance further in the tournament and become a perennial National threat. Ryan wants to be a part of this. Ryan’s older brother also just started school there so that played a role in the decision. He/we also like to the location being close to home. It was just a perfect fit all around. Having the website for Ryan was huge. We were actually on a college tour and the baseball coach asked if we had any video of Ryan. On the spot we pulled up the Sportforce website and he was able to see his video. This was a big plus. I had just wished we had a more recent video package as it was over a year old. The access to college coach e-mails was also key to streamlining the process. We also liked the regular advice on how to navigate the process and the proper way to approach coaches and put together e-mails to coaches. All in all it was very much worth the $. First and foremost the player needs to play with and against the best players in their area. Being the best player on a horrible team and only playing local tournaments does you no good. The travel ball and high school team that they play for is important as the better ones just get more scouts coming to their games. Ryan is very fortunate to play for the San Diego Show and La Costa Canyon High School. The coaches in both of these organizations are the best around and have helped Ryan with his development and promotion to colleges. The recruiters, in my opinion, can sniff out talent very quickly and if you are not good enough to play in college then all the exposure and websites will not do you any good. Having said that, it is equally important to be proactive with how your son or daughter gets their information out there. The top players will get found whether or not they self promote. If you are not in the group, however, then you need to do some self promotion. Sportsforce is a great way to organize the process. They know how and when to do each step. Coaches get hundreds of e-mails and letters each week from parents and players. Yours needs to stand out or it doesn’t get read. Sportsforce provides an easy template for getting you thru this process.